For other uses, see Infrared (disambiguation). A pseudocolor image of two people taken in long-wavelength infrared (body-temperature thermal) light. Infrared radiation (IR), sometimes called infrared light, is electromagnetic radiation (EMR) with longer wavelengths than those of visible light, and is therefore generally invisible to the human eye, although IR at wavelengths up to 1050 nanometers (nm)s from specially pulsed lasers can be seen by humans under certain conditions. IR wavelengths extend from the nominal red edge of the visible spectrum at 700 nanometers (frequency 430 THz), to 1 millimeter (300 GHz). Most of the thermal radiation emitted by objects near room temperature is infrared. As with all EMR, IR carries radiant energy and behaves both like a wave and like its quantum particle, the photon. Infrared radiation was discovered in 1800 by astronomer Sir William Herschel, who discovered a type of invisible radiation in the spectrum lower in energy than red light, by means of its effect on a thermometer. Slightly more than half of the total energy from the Sun was eventually found to arrive on Earth in the form of infrared. The balance between absorbed and emitted infrared radiation has a critical effect on Earth's climate. Infrared radiation is emitted or absorbed by molecules when they change their rotational-vibrational movements. It excites vibrational modes in a molecule through a change in the dipole moment, making it a useful frequency range for study of these energy states for molecules of the proper symmetry. Infrared spectroscopy examines absorption and transmission of photons in the infrared range. Infrared radiation is used in industrial, scientific, military, law enforcement, and medical applications. Night-vision devices using active near-infrared illumination allow people or animals to be observed without the observer being detected. 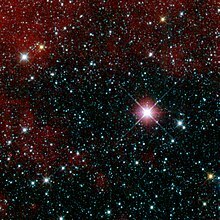 Infrared astronomy uses sensor-equipped telescopes to penetrate dusty regions of space such as molecular clouds, detect objects such as planets, and to view highly red-shifted objects from the early days of the universe. Infrared thermal-imaging cameras are used to detect heat loss in insulated systems, to observe changing blood flow in the skin, and to detect overheating of electrical apparatus. Extensive uses for military and civilian applications include target acquisition, surveillance, night vision, homing, and tracking. Humans at normal body temperature radiate chiefly at wavelengths around 10 μm (micrometers). Non-military uses include thermal efficiency analysis, environmental monitoring, industrial facility inspections, detection of grow-ops, remote temperature sensing, short-range wireless communication, spectroscopy, and weather forecasting. Infrared radiation extends from the nominal red edge of the visible spectrum at 700 nanometers (nm) to 1 millimeter (mm). This range of wavelengths corresponds to a frequency range of approximately 430 THz down to 300 GHz. Below infrared is the microwave portion of the electromagnetic spectrum. Sunlight, at an effective temperature of 5,780 kelvins (9,944° Fahrenheit), is composed of near-thermal-spectrum radiation that is slightly more than half infrared. At zenith, sunlight provides an irradiance of just over 1 kilowatt per square meter at sea level. Of this energy, 527 watts is infrared radiation, 445 watts is visible light, and 32 watts is ultraviolet radiation. Nearly all the infrared radiation in sunlight is near infrared, shorter than 4 micrometers. On the surface of Earth, at far lower temperatures than the surface of the Sun, some thermal radiation consists of infrared in the mid-infrared region, much longer than in sunlight. However, black body or thermal radiation is continuous: it gives off radiation at all wavelengths. Of these natural thermal radiation processes, only lightning and natural fires are hot enough to produce much visible energy, and fires produce far more infrared than visible-light energy. In general, objects emit infrared radiation across a spectrum of wavelengths, but sometimes only a limited region of the spectrum is of interest because sensors usually collect radiation only within a specific bandwidth. Thermal infrared radiation also has a maximum emission wavelength, which is inversely proportional to the absolute temperature of object, in accordance with Wien's displacement law. Therefore, the infrared band is often subdivided into smaller sections. (3,591–1,797 °C) Defined by water absorption,[clarification needed] and commonly used in fiber optic telecommunication because of low attenuation losses in the SiO2 glass (silica) medium. Image intensifiers are sensitive to this area of the spectrum; examples include night vision devices such as night vision goggles. Near-infrared spectroscopy is another common application. (1,797–693 °C) Water absorption increases significantly at 1450 nm. The 1530 to 1560 nm range is the dominant spectral region for long-distance telecommunications. (693–89 °C) In guided missile technology the 3–5 µm portion of this band is the atmospheric window in which the homing heads of passive IR 'heat seeking' missiles are designed to work, homing on to the Infrared signature of the target aircraft, typically the jet engine exhaust plume. This region is also known as thermal infrared. (89 – −80 °C) The "thermal imaging" region, in which sensors can obtain a completely passive image of objects only slightly higher in temperature than room temperature - for example, the human body - based on thermal emissions only and requiring no illumination such as the sun, moon, or infrared illuminator. This region is also called the "thermal infrared". A comparison of a thermal image (top) and an ordinary photograph (bottom) shows that a trash bag is transparent, but glass (the man's spectacles) is opaque in long-wavelength infrared. 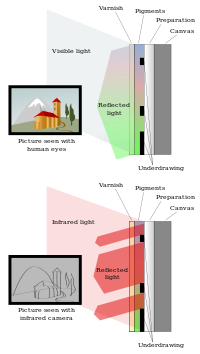 NIR and SWIR is sometimes called "reflected infrared", whereas MWIR and LWIR is sometimes referred to as "thermal infrared". Due to the nature of the blackbody radiation curves, typical "hot" objects, such as exhaust pipes, often appear brighter in the MW compared to the same object viewed in the LW. Far-Infrared FIR (25–40) to (200–350) µm. These divisions are not precise and can vary depending on the publication. The three regions are used for observation of different temperature ranges, and hence different environments in space. The most common photometric system used in astronomy allocates capital letters to different spectral regions according to filters used; I, J, H, and K cover the near-infrared wavelengths; L, M, N, and Q refer to the mid-infrared region. These letters are commonly understood in reference to atmospheric windows and appear, for instance, in the titles of many papers. Near-infrared: from 0.7 to 1.0 µm (from the approximate end of the response of the human eye to that of silicon). Short-wave infrared: 1.0 to 3 µm (from the cut-off of silicon to that of the MWIR atmospheric window). InGaAs covers to about 1.8 µm; the less sensitive lead salts cover this region. Mid-wave infrared: 3 to 5 µm (defined by the atmospheric window and covered by indium antimonide [InSb] and mercury cadmium telluride [HgCdTe] and partially by lead selenide [PbSe]). Long-wave infrared: 8 to 12, or 7 to 14 µm (this is the atmospheric window covered by HgCdTe and microbolometers). Very-long wave infrared (VLWIR) (12 to about 30 µm, covered by doped silicon). Near-infrared is the region closest in wavelength to the radiation detectable by the human eye. mid- and far-infrared are progressively further from the visible spectrum. Other definitions follow different physical mechanisms (emission peaks, vs. bands, water absorption) and the newest follow technical reasons (the common silicon detectors are sensitive to about 1,050 nm, while InGaAs's sensitivity starts around 950 nm and ends between 1,700 and 2,600 nm, depending on the specific configuration). No international standards for these specifications are currently available. The onset of infrared is defined (according to different standards) at various values typically between 700 nm and 800 nm, but the boundary between visible and infrared light is not precisely defined. The human eye is markedly less sensitive to light above 700 nm wavelength, so longer wavelengths make insignificant contributions to scenes illuminated by common light sources. However, particularly intense near-IR light (e.g., from IR lasers, IR LED sources, or from bright daylight with the visible light removed by colored gels) can be detected up to approximately 780 nm, and will be perceived as red light. Intense light sources providing wavelengths as long as 1050 nm can be seen as a dull red glow, causing some difficulty in near-IR illumination of scenes in the dark (usually this practical problem is solved by indirect illumination). Leaves are particularly bright in the near IR, and if all visible light leaks from around an IR-filter are blocked, and the eye is given a moment to adjust to the extremely dim image coming through a visually opaque IR-passing photographic filter, it is possible to see the Wood effect that consists of IR-glowing foliage. The C-band is the dominant band for long-distance telecommunication networks. The S and L bands are based on less well established technology, and are not as widely deployed. Materials with higher emissivity appear to be hotter. 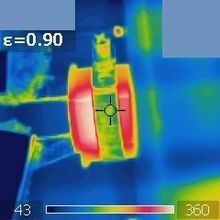 In this thermal image, the ceramic cylinder appears to be hotter than its cubic container (made of silicon carbide), while in fact, they have the same temperature. Infrared radiation is popularly known as "heat radiation", but light and electromagnetic waves of any frequency will heat surfaces that absorb them. Infrared light from the Sun accounts for 49% of the heating of Earth, with the rest being caused by visible light that is absorbed then re-radiated at longer wavelengths. Visible light or ultraviolet-emitting lasers can char paper and incandescently hot objects emit visible radiation. Objects at room temperature will emit radiation concentrated mostly in the 8 to 25 µm band, but this is not distinct from the emission of visible light by incandescent objects and ultraviolet by even hotter objects (see black body and Wien's displacement law). Heat is energy in transit that flows due to a temperature difference. Unlike heat transmitted by thermal conduction or thermal convection, thermal radiation can propagate through a vacuum. Thermal radiation is characterized by a particular spectrum of many wavelengths that are associated with emission from an object, due to the vibration of its molecules at a given temperature. Thermal radiation can be emitted from objects at any wavelength, and at very high temperatures such radiation is associated with spectra far above the infrared, extending into visible, ultraviolet, and even X-ray regions (e.g. the solar corona). Thus, the popular association of infrared radiation with thermal radiation is only a coincidence based on typical (comparatively low) temperatures often found near the surface of planet Earth. 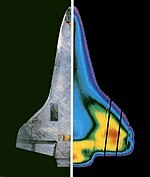 The concept of emissivity is important in understanding the infrared emissions of objects. This is a property of a surface that describes how its thermal emissions deviate from the idea of a black body. To further explain, two objects at the same physical temperature will not show the same infrared image if they have differing emissivity. For example, for any pre-set emissivity value, objects with higher emissivity will appear hotter, and those with a lower emissivity will appear cooler. For that reason, incorrect selection of emissivity will give inaccurate results when using infrared cameras and pyrometers. Infrared is used in night vision equipment when there is insufficient visible light to see. Night vision devices operate through a process involving the conversion of ambient light photons into electrons that are then amplified by a chemical and electrical process and then converted back into visible light. Infrared light sources can be used to augment the available ambient light for conversion by night vision devices, increasing in-the-dark visibility without actually using a visible light source. The use of infrared light and night vision devices should not be confused with thermal imaging, which creates images based on differences in surface temperature by detecting infrared radiation (heat) that emanates from objects and their surrounding environment. Infrared radiation can be used to remotely determine the temperature of objects (if the emissivity is known). This is termed thermography, or in the case of very hot objects in the NIR or visible it is termed pyrometry. Thermography (thermal imaging) is mainly used in military and industrial applications but the technology is reaching the public market in the form of infrared cameras on cars due to the massively reduced production costs. Thermographic cameras detect radiation in the infrared range of the electromagnetic spectrum (roughly 900–14,000 nanometers or 0.9–14 μm) and produce images of that radiation. Since infrared radiation is emitted by all objects based on their temperatures, according to the black body radiation law, thermography makes it possible to "see" one's environment with or without visible illumination. The amount of radiation emitted by an object increases with temperature, therefore thermography allows one to see variations in temperature (hence the name). Hyperspectral thermal infrared emission measurement, an outdoor scan in winter conditions, ambient temperature −15 °C, image produced with a Specim LWIR hyperspectral imager. Relative radiance spectra from various targets in the image are shown with arrows. The infrared spectra of the different objects such as the watch clasp have clearly distinctive characteristics. The contrast level indicates the temperature of the object. A hyperspectral image is a "picture" containing continuous spectrum through a wide spectral range at each pixel. Hyperspectral imaging is gaining importance in the field of applied spectroscopy particularly with NIR, SWIR, MWIR, and LWIR spectral regions. Typical applications include biological, mineralogical, defence, and industrial measurements. Thermal infrared hyperspectral imaging can be similarly performed using a Thermographic camera, with the fundamental difference that each pixel contains a full LWIR spectrum. Consequently, chemical identification of the object can be performed without a need for an external light source such as the sun or the moon. Such cameras are typically applied for geological measurements, outdoor surveillance and UAV applications. In infrared photography, infrared filters are used to capture the near-infrared spectrum. Digital cameras often use infrared blockers. Cheaper digital cameras and camera phones have less effective filters and can "see" intense near-infrared, appearing as a bright purple-white color. This is especially pronounced when taking pictures of subjects near IR-bright areas (such as near a lamp), where the resulting infrared interference can wash out the image. There is also a technique called 'T-ray' imaging, which is imaging using far-infrared or terahertz radiation. Lack of bright sources can make terahertz photography more challenging than most other infrared imaging techniques. Recently T-ray imaging has been of considerable interest due to a number of new developments such as terahertz time-domain spectroscopy. Reflected light photograph in various infrared spectra to illustrate the appearance as the wavelength of light changes. Infrared tracking, also known as infrared homing, refers to a passive missile guidance system, which uses the emission from a target of electromagnetic radiation in the infrared part of the spectrum to track it. Missiles that use infrared seeking are often referred to as "heat-seekers" since infrared (IR) is just below the visible spectrum of light in frequency and is radiated strongly by hot bodies. Many objects such as people, vehicle engines, and aircraft generate and retain heat, and as such, are especially visible in the infrared wavelengths of light compared to objects in the background. Infrared radiation can be used as a deliberate heating source. For example, it is used in infrared saunas to heat the occupants. It may also be used in other heating applications, such as to remove ice from the wings of aircraft (de-icing). Infrared can be used in cooking and heating food as it predominantly heats the opaque, absorbent objects, rather than the air around them. Infrared heating is also becoming more popular in industrial manufacturing processes, e.g. curing of coatings, forming of plastics, annealing, plastic welding, and print drying. In these applications, infrared heaters replace convection ovens and contact heating. Efficiency is achieved by matching the wavelength of the infrared heater to the absorption characteristics of the material. A variety of technologies or proposed technologies take advantage of infrared emissions to cool buildings or other systems. The LWIR (8–15 µm) region is especially useful since some radiation at these wavelengths can escape into space through the atmosphere. IR data transmission is also employed in short-range communication among computer peripherals and personal digital assistants. These devices usually conform to standards published by IrDA, the Infrared Data Association. 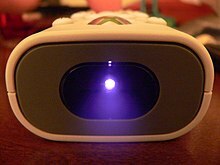 Remote controls and IrDA devices use infrared light-emitting diodes (LEDs) to emit infrared radiation that is focused by a plastic lens into a narrow beam. The beam is modulated, i.e. switched on and off, to prevent interference from other sources of infrared (like sunlight or artificial lighting). The receiver uses a silicon photodiode to convert the infrared radiation to an electric current. It responds only to the rapidly pulsing signal created by the transmitter, and filters out slowly changing infrared radiation from ambient light. Infrared communications are useful for indoor use in areas of high population density. IR does not penetrate walls and so does not interfere with other devices in adjoining rooms. Infrared is the most common way for remote controls to command appliances. Infrared remote control protocols like RC-5, SIRC, are used to communicate with infrared. Free space optical communication using infrared lasers can be a relatively inexpensive way to install a communications link in an urban area operating at up to 4 gigabit/s, compared to the cost of burying fiber optic cable, except for the radiation damage. "Since the eye cannot detect IR, blinking or closing the eyes to help prevent or reduce damage may not happen." Infrared lasers are used to provide the light for optical fiber communications systems. Infrared light with a wavelength around 1,330 nm (least dispersion) or 1,550 nm (best transmission) are the best choices for standard silica fibers. IR data transmission of encoded audio versions of printed signs is being researched as an aid for visually impaired people through the RIAS (Remote Infrared Audible Signage) project. Transmitting IR data from one device to another is sometimes referred to as beaming. Infrared vibrational spectroscopy (see also near-infrared spectroscopy) is a technique that can be used to identify molecules by analysis of their constituent bonds. Each chemical bond in a molecule vibrates at a frequency characteristic of that bond. A group of atoms in a molecule (e.g., CH2) may have multiple modes of oscillation caused by the stretching and bending motions of the group as a whole. If an oscillation leads to a change in dipole in the molecule then it will absorb a photon that has the same frequency. The vibrational frequencies of most molecules correspond to the frequencies of infrared light. Typically, the technique is used to study organic compounds using light radiation from 4000–400 cm−1, the mid-infrared. A spectrum of all the frequencies of absorption in a sample is recorded. This can be used to gain information about the sample composition in terms of chemical groups present and also its purity (for example, a wet sample will show a broad O-H absorption around 3200 cm−1). The unit for expressing radiation in this application, cm−1, is the spectroscopic wavenumber. It is the frequency divided by the speed of light in vacuum. In the semiconductor industry, infrared light can be used to characterize materials such as thin films and periodic trench structures. By measuring the reflectance of light from the surface of a semiconductor wafer, the index of refraction (n) and the extinction Coefficient (k) can be determined via the Forouhi-Bloomer dispersion equations. The reflectance from the infrared light can also be used to determine the critical dimension, depth, and sidewall angle of high aspect ratio trench structures. IR Satellite picture taken 1315 Z on 15th October 2006. A frontal system can be seen in the Gulf of Mexico with embedded Cumulonimbus cloud. Shallower Cumulus and Stratocumulus can be seen off the Eastern Seaboard. Weather satellites equipped with scanning radiometers produce thermal or infrared images, which can then enable a trained analyst to determine cloud heights and types, to calculate land and surface water temperatures, and to locate ocean surface features. The scanning is typically in the range 10.3–12.5 µm (IR4 and IR5 channels). High, cold ice clouds such as Cirrus or Cumulonimbus show up bright white, lower warmer clouds such as Stratus or Stratocumulus show up as grey with intermediate clouds shaded accordingly. Hot land surfaces will show up as dark-grey or black. One disadvantage of infrared imagery is that low cloud such as stratus or fog can be a similar temperature to the surrounding land or sea surface and does not show up. However, using the difference in brightness of the IR4 channel (10.3–11.5 µm) and the near-infrared channel (1.58–1.64 µm), low cloud can be distinguished, producing a fog satellite picture. The main advantage of infrared is that images can be produced at night, allowing a continuous sequence of weather to be studied. These infrared pictures can depict ocean eddies or vortices and map currents such as the Gulf Stream, which are valuable to the shipping industry. Fishermen and farmers are interested in knowing land and water temperatures to protect their crops against frost or increase their catch from the sea. Even El Niño phenomena can be spotted. Using color-digitized techniques, the gray-shaded thermal images can be converted to color for easier identification of desired information. The main water vapour channel at 6.40 to 7.08 µm can be imaged by some weather satellites and shows the amount of moisture in the atmosphere. In the field of climatology, atmospheric infrared radiation is monitored to detect trends in the energy exchange between the earth and the atmosphere. These trends provide information on long-term changes in Earth's climate. It is one of the primary parameters studied in research into global warming, together with solar radiation. A pyrgeometer is utilized in this field of research to perform continuous outdoor measurements. This is a broadband infrared radiometer with sensitivity for infrared radiation between approximately 4.5 µm and 50 µm. 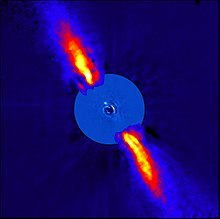 Beta Pictoris with its planet Beta Pictoris b, the light-blue dot off-center, as seen in infrared. It combines two images, the inner disc is at 3.6 µm. Astronomers observe objects in the infrared portion of the electromagnetic spectrum using optical components, including mirrors, lenses and solid state digital detectors. For this reason it is classified as part of optical astronomy. To form an image, the components of an infrared telescope need to be carefully shielded from heat sources, and the detectors are chilled using liquid helium. The sensitivity of Earth-based infrared telescopes is significantly limited by water vapor in the atmosphere, which absorbs a portion of the infrared radiation arriving from space outside of selected atmospheric windows. This limitation can be partially alleviated by placing the telescope observatory at a high altitude, or by carrying the telescope aloft with a balloon or an aircraft. Space telescopes do not suffer from this handicap, and so outer space is considered the ideal location for infrared astronomy. Infrared light is also useful for observing the cores of active galaxies, which are often cloaked in gas and dust. Distant galaxies with a high redshift will have the peak portion of their spectrum shifted toward longer wavelengths, so they are more readily observed in the infrared. Infrared cleaning is a technique used by some motion picture film scanners, film scanners and flatbed scanners to reduce or remove the effect of dust and scratches upon the finished scan. It works by collecting an additional infrared channel from the scan at the same position and resolution as the three visible color channels (red, green, and blue). The infrared channel, in combination with the other channels, is used to detect the location of scratches and dust. Once located, those defects can be corrected by scaling or replaced by inpainting. Infrared reflectography [fr; it; es], as called by art conservators, can be applied to paintings to reveal underlying layers in a completely non-destructive manner, in particular the underdrawing or outline drawn by the artist as a guide. This often reveals the artist's use of carbon black, which shows up well in reflectograms, as long as it has not also been used in the ground underlying the whole painting. Art conservators are looking to see whether the visible layers of paint differ from the underdrawing or layers in between – such alterations are called pentimenti when made by the original artist. This is very useful information in deciding whether a painting is the prime version by the original artist or a copy, and whether it has been altered by over-enthusiastic restoration work. In general, the more pentimenti the more likely a painting is to be the prime version. It also gives useful insights into working practices. 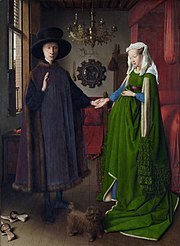 Among many other changes in the Arnolfini Portrait of 1434 (left), the man's face was originally higher by about the height of his eye; the woman's was higher, and her eyes looked more to the front. Each of his feet was underdrawn in one position, painted in another, and then overpainted in a third. These alterations are seen in infrared reflectograms. Recent progress in the design of infrared sensitive cameras made it possible to discover and depict not only underpaintings and pentimenti but entire paintings which were later overpainted by the artist. Notable examples are Picasso's Woman Ironing and Blue Room, where in both cases, a portrait of a man has been made visible under the painting as it is known today. Similar uses of infrared are made by conservators and scientists on various types of objects, especially very old written documents such as the Dead Sea Scrolls, the Roman works in the Villa of the Papyri, and the Silk Road texts found in the Dunhuang Caves. Carbon black used in ink can show up extremely well. The pit viper has a pair of infrared sensory pits on its head. There is uncertainty regarding the exact thermal sensitivity of this biological infrared detection system. Other organisms that have thermoreceptive organs are pythons (family Pythonidae), some boas (family Boidae), the Common Vampire Bat (Desmodus rotundus), a variety of jewel beetles (Melanophila acuminata), darkly pigmented butterflies (Pachliopta aristolochiae and Troides rhadamantus plateni), and possibly blood-sucking bugs (Triatoma infestans). Although near-infrared vision (780–1000 nm) has long been deemed impossible due to noise in visual pigments, sensation of near-infrared light was reported in the common carp and in three cichlid species. Fish use NIR to capture prey and for phototactic swimming orientation. NIR sensation in fish may be relevant under poor lighting conditions during twilight and in turbid surface waters. Near-infrared light, or photobiomodulation, is used for treatment of chemotherapy-induced oral ulceration as well as wound healing. There is some work relating to anti-herpes virus treatment. Research projects include work on central nervous system healing effects via cytochrome c oxidase upregulation and other possible mechanisms. Strong infrared radiation in certain industry high-heat settings may be hazardous to the eyes, resulting in damage or blindness to the user. Since the radiation is invisible, special IR-proof goggles must be worn in such places. The discovery of infrared radiation is ascribed to William Herschel, the astronomer, in the early 19th century. Herschel published his results in 1800 before the Royal Society of London. Herschel used a prism to refract light from the sun and detected the infrared, beyond the red part of the spectrum, through an increase in the temperature recorded on a thermometer. He was surprised at the result and called them "Calorific Rays". The term 'Infrared' did not appear until late 19th century. 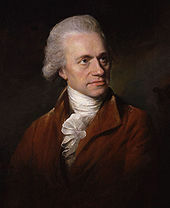 Infrared radiation was discovered in 1800 by William Herschel. 1737: Émilie du Châtelet predicted what is today known as infrared radiation in Dissertation sur la nature et la propagation du feu. 1830: Leopoldo Nobili made the first thermopile IR detector. 1840: John Herschel produces the first thermal image, called a thermogram. 1873: Willoughby Smith discovered the photoconductivity of selenium. 1878: Samuel Pierpont Langley invents the first bolometer, a device which is able to measure small temperature fluctuations, and thus the power of far infrared sources. 1879: Stefan–Boltzmann law formulated empirically that the power radiated by a blackbody is proportional to T4. 1880s and 1890s: Lord Rayleigh and Wilhelm Wien solved part of the blackbody equation, but both solutions diverged in parts of the electromagnetic spectrum. This problem was called the "Ultraviolet catastrophe and Infrared Catastrophe". 1892: Willem Henri Julius published infrared spectra of 20 organic compounds measured with a bolometer in units of angular displacement. 1901: Max Planck published the blackbody equation and theorem. He solved the problem by quantizing the allowable energy transitions. 1905: Albert Einstein developed the theory of the photoelectric effect. 1905-1908: William Coblentz published infrared spectra in units of wavelength (microns) for several chemical compounds in Investigations of Infra-Red Spectra. 1917: Theodore Case developed the thallous sulfide detector; British scientist built the first infra-red search and track (IRST) device able to detect aircraft at a range of one mile (1.6 km). 1935: Lead salts – early missile guidance in World War II. 1938: Teau Ta – predicted that the pyroelectric effect could be used to detect infrared radiation. 1945: The Zielgerät 1229 "Vampir" infrared weapon system was introduced as the first portable infrared device for military applications. 1952: H. Welker grew synthetic InSb crystals. 1950s: Paul Kruse (at Honeywell) and Texas Instruments recorded infrared images. 1950s and 1960s: Nomenclature and radiometric units defined by Fred Nicodemenus, G.J. Zissis and R. Clark; Robert Clark Jones defined D*. 1958: W.D. Lawson (Royal Radar Establishment in Malvern) discovered IR detection properties of HgCdTe. 1958: Falcon and Sidewinder missiles were developed using infrared technology. 1961: J. Cooper demonstrated pyroelectric detection. 1964: W.G. Evans discovered infrared thermoreceptors in a pyrophile beetle. 1965: First IR Handbook; first commercial imagers (Barnes, Agema (now part of FLIR Systems Inc.)); Richard Hudson's landmark text; F4 TRAM FLIR by Hughes; phenomenology pioneered by Fred Simmons and A.T. Stair; U.S. Army's night vision lab formed (now Night Vision and Electronic Sensors Directorate (NVESD)), and Rachets develops detection, recognition and identification modeling there. 1970: Willard Boyle and George E. Smith proposed CCD at Bell Labs for picture phone. 1972: Common module program started by NVESD. 1978: Infrared imaging astronomy came of age, observatories planned, IRTF on Mauna Kea opened; 32 by 32 and 64 by 64 arrays produced using InSb, HgCdTe and other materials. 2013: On February 14, researchers developed a neural implant that gives rats the ability to sense infrared light which for the first time provides living creatures with new abilities, instead of simply replacing or augmenting existing abilities. ^ Sliney, David H.; Wangemann, Robert T.; Franks, James K.; Wolbarsht, Myron L. (1976). "Visual sensitivity of the eye to infrared laser radiation". Journal of the Optical Society of America. 66 (4): 339–341. doi:10.1364/JOSA.66.000339. (Subscription required (help)). The foveal sensitivity to several near-infrared laser wavelengths was measured. It was found that the eye could respond to radiation at wavelengths at least as far as 1064 nm. A continuous 1064 nm laser source appeared red, but a 1060 nm pulsed laser source appeared green, which suggests the presence of second harmonic generation in the retina. 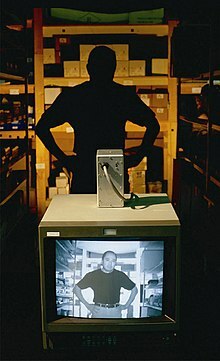 ^ Dash, Madhab Chandra; Dash, Satya Prakash (2009). Fundamentals Of Ecology 3E. Tata McGraw-Hill Education. p. 213. ISBN 978-1-259-08109-5. Retrieved 18 October 2013. Normally the human eye responds to light rays from 390 to 760 nm. This can be extended to a range of 310 to 1,050 nm under artificial conditions. ^ Saidman, Jean (15 May 1933). "Sur la visibilité de l'ultraviolet jusqu'à la longueur d'onde 3130" [The visibility of the ultraviolet to the wave length of 3130]. Comptes rendus de l'Académie des sciences (in French). 196: 1537–9. ^ Liew, S. C. "Electromagnetic Waves". Centre for Remote Imaging, Sensing and Processing. Retrieved 2006-10-27. ^ Michael Rowan-Robinson (2013). Night Vision: Exploring the Infrared Universe. Cambridge University Press. p. 23. ISBN 1107024765. ^ Reusch, William (1999). "Infrared Spectroscopy". Michigan State University. Archived from the original on 2007-10-27. Retrieved 2006-10-27. ^ a b "IR Astronomy: Overview". NASA Infrared Astronomy and Processing Center. Archived from the original on 2006-12-08. Retrieved 2006-10-30. ^ Haynes, William M., ed. (2011). CRC Handbook of Chemistry and Physics (92nd ed.). CRC Press. p. 10.233. ISBN 978-1-4398-5511-9. ^ "Reference Solar Spectral Irradiance: Air Mass 1.5". Retrieved 2009-11-12. ^ Byrnes, James (2009). Unexploded Ordnance Detection and Mitigation. Springer. pp. 21–22. ISBN 978-1-4020-9252-7. ^ "Peaks of Blackbody Radiation Intensity". Retrieved 27 July 2016. ^ "Photoacoustic technique 'hears' the sound of dangerous chemical agents". R&D Magazine. August 14, 2012. rdmag.com. Retrieved September 8, 2012. ^ Henderson, Roy. "Wavelength considerations". Instituts für Umform- und Hochleistungs. Archived from the original on 2007-10-28. Retrieved 2007-10-18. ^ "Near, Mid and Far-Infrared". NASA IPAC. Archived from the original on 2012-05-29. Retrieved 2007-04-04. ^ Griffin, Donald R.; Hubbard, Ruth; Wald, George (1947). "The Sensitivity of the Human Eye to Infra-Red Radiation". Journal of the Optical Society of America. 37 (7): 546–553. doi:10.1364/JOSA.37.000546. ^ Ramaswami, Rajiv (May 2002). "Optical Fiber Communication: From Transmission to Networking" (PDF). IEEE. Retrieved 2006-10-18. ^ "Infrared Radiation". Infrared Radiation. Van Nostrand's Scientific Encyclopedia. John Wiley & Sons, Inc. 2007. doi:10.1002/0471743984.vse4181.pub2. ISBN 978-0471743989. ^ "Introduction to Solar Energy" (DOC). Passive Solar Heating & Cooling Manual. Rodale Press, Inc. 1980. Retrieved 2007-08-12. ^ McCreary, Jeremy (October 30, 2004). "Infrared (IR) basics for digital photographers-capturing the unseen (Sidebar: Black Body Radiation)". Digital Photography For What It's Worth. Retrieved 2006-11-07. ^ a b c "How Night Vision Works". American Technologies Network Corporation. Retrieved 2007-08-12. ^ Bryant, Lynn (2007-06-11). "How does thermal imaging work? A closer look at what is behind this remarkable technology". Retrieved 2007-08-12. ^ Mahulikar, S.P. ; Sonawane, H.R. ; Rao, G.A. (2007). "Infrared signature studies of aerospace vehicles" (PDF). Progress in Aerospace Sciences. 43 (7–8): 218–245. Bibcode:2007PrAeS..43..218M. CiteSeerX 10.1.1.456.9135. doi:10.1016/j.paerosci.2007.06.002. ^ Dangers of Overexposure to ultraviolet, infrared and high-energy visible light | 2013-01-03. ISHN. Retrieved on 2017-04-26. ^ "IR Reflectography for Non-destructive Analysis of Underdrawings in Art Objects". Sensors Unlimited, Inc. Retrieved 2009-02-20. ^ "The Mass of Saint Gregory: Examining a Painting Using Infrared Reflectography". The Cleveland Museum of Art. Retrieved 2009-02-20. ^ "International Dunhuang Project An Introduction to digital infrared photography and its application within IDP -paper pdf 6.4 MB". Idp.bl.uk. Retrieved 2011-11-08. ^ Jones, B.S. ; Lynn, W.F. ; Stone, M.O. (2001). "Thermal Modeling of Snake Infrared Reception: Evidence for Limited Detection Range". Journal of Theoretical Biology. 209 (2): 201–211. doi:10.1006/jtbi.2000.2256. PMID 11401462. ^ Gorbunov, V.; Fuchigami, N.; Stone, M.; Grace, M.; Tsukruk, V. V. (2002). "Biological Thermal Detection: Micromechanical and Microthermal Properties of Biological Infrared Receptors". Biomacromolecules. 3 (1): 106–115. doi:10.1021/bm015591f. PMID 11866562. ^ a b Evans, W.G. (1966). "Infrared receptors in Melanophila acuminata De Geer". Nature. 202 (4928): 211. Bibcode:1964Natur.202..211E. doi:10.1038/202211a0. ^ Campbell, Angela L.; Naik, Rajesh R.; Sowards, Laura; Stone, Morley O. (2002). "Biological infrared imaging and sensing". Micrometre. 33 (2): 211–225. doi:10.1016/S0968-4328(01)00010-5. PMID 11567889. ^ Brook, P. J. (26 April 1969). "Stimulation of Ascospore Release in Venturia inaequalis by Far Red Light". Nature. 222 (5191): 390–392. Bibcode:1969Natur.222..390B. doi:10.1038/222390a0. ISSN 0028-0836. ^ a b c d Meuthen, Denis; Rick, Ingolf P.; Thünken, Timo; Baldauf, Sebastian A. (2012). "Visual prey detection by near-infrared cues in a fish". Naturwissenschaften. 99 (12): 1063–6. Bibcode:2012NW.....99.1063M. doi:10.1007/s00114-012-0980-7. PMID 23086394. ^ Endo, M.; Kobayashi R.; Ariga, K.; Yoshizaki, G.; Takeuchi, T. (2002). "Postural control in tilapia under microgravity and the near infrared irradiated conditions". Nippon Suisan Gakkaish. 68 (6): 887–892. doi:10.2331/suisan.68.887. ^ Kobayashi R.; Endo, M.; Yoshizaki, G.; Takeuchi, T. (2002). "Sensitivity of tilapia to infrared light measured using a rotating striped drum differs between two strains". Nippon Suisan Gakkaish. 68 (5): 646–651. doi:10.2331/suisan.68.646. ^ Matsumoto, Taro; Kawamura, Gunzo (2005). "The eyes of the common carp and Nile tilapia are sensitive to near-infrared". Fisheries Science. 71 (2): 350–355. doi:10.1111/j.1444-2906.2005.00971.x. ^ a b c Shcherbakov, Denis; Knörzer, Alexandra; Hilbig, Reinhard; Haas, Ulrich; Blum, Martin (2012). "Near-infrared orientation of Mozambique tilapia Oreochromis mossambicus". Zoology. 115 (4): 233–238. doi:10.1016/j.zool.2012.01.005. PMID 22770589. ^ Hargate, G (2006). "A randomised double-blind study comparing the effect of 1072-nm light against placebo for the treatment of herpes labialis". Clinical and Experimental Dermatology. 31 (5): 638–41. doi:10.1111/j.1365-2230.2006.02191.x. PMID 16780494. ^ Desmet KD, Paz DA, Corry JJ, Eells JT, Wong-Riley MT, Henry MM, Buchmann EV, Connelly MP, Dovi JV, Liang HL, Henshel DS, Yeager RL, Millsap DS, Lim J, Gould LJ, Das R, Jett M, Hodgson BD, Margolis D, Whelan HT (May 2006). "Clinical and experimental applications of NIR-LED photobiomodulation". Photomedicine and Laser Surgery. 24 (2): 121–8. doi:10.1089/pho.2006.24.121. PMID 16706690. ^ Rosso, Monona l (2001). The Artist's Complete Health and Safety Guide. Allworth Press. pp. 33–. ISBN 978-1-58115-204-3. ^ Herschel, William (1800). "Experiments on the refrangibility of the invisible rays of the sun". Philosophical Transactions of the Royal Society of London. 90: 284–292. doi:10.1098/rstl.1800.0015. JSTOR 107057. ^ "Herschel Discovers Infrared Light". Coolcosmos.ipac.caltech.edu. Archived from the original on 2012-02-25. Retrieved 2011-11-08. Becquerel, Edmond (1867). La Lumiere: Ses causes et ses effets [Light: Its causes and effects] (in French). Paris, France: Didot Frères, Fils et Cie. pp. 141–145. The word infra-rouge was translated into English as "infrared" in 1874, in a translation of an article by Vignaud Dupuy de Saint-Florent (1830–1907), an engineer in the French army, who attained the rank of lieutenant colonel and who pursued photography as a pastime. de Saint-Florent (10 April 1874). "Photography in natural colours". The Photographic News. 18: 175–176. From p. 176: "As to the infra-red rays, they may be absorbed by means of a weak solution of sulphate of copper, … ." Rosenberg, Gary (2012). "Letter to the Editors: Infrared dating". American Scientist. 100 (5): 355. Nobili, Leopoldo (1830). "Description d'un thermo-multiplicateur ou thermoscope électrique" [Description of a thermo-multiplier or electric thermoscope]. Bibliothèque Universelle (in French). 44: 225–234. Nobili; Melloni (1831). "Recherches sur plusieurs phénomènes calorifiques entreprises au moyen du thermo-multiplicateur" [Investigations of several heat phenomena undertaken via a thermo-multiplier]. Annales de Chimie et de Physique. 2nd series (in French). 48: 198–218. Vollmer, Michael; Möllmann, Klaus-Peter (2010). Infrared Thermal Imaging: Fundamentals, Research and Applications (2nd ed.). Berlin, Germany: Wiley-VCH. pp. 1–67. ISBN 9783527693290. ^ Herschel, John F.W. (1840). "On chemical action of rays of solar spectrum on preparation of silver and other substances both metallic and nonmetallic and on some photographic processes". Philosophical Transactions of the Royal Society of London. 130: 1–59. Bibcode:1840RSPT..130....1H. doi:10.1098/rstl.1840.0002. The term "thermograph" is coined on p. 51: " … I have discovered a process by which the calorific rays in the solar spectrum are made to leave their impress on a surface properly prepared for the purpose, so as to form what may be called a thermograph of the spectrum, … "
Kirchhoff (1859). "Ueber den Zusammenhang von Emission und Absorption von Licht und Warme" [On the relation between emission and absorption of light and heat]. Monatsberichte der Königlich-Preussischen Akademie der Wissenschaften zu Berlin (Monthly Reports of the Royal Prussian Academy of Philosophy in Berlin) (in German): 783–787. Kirchhoff, G. (1860). "Ueber das Verhältnis zwischen dem Emissionsvermögen und dem Absorptionsvermögen der Körper für Wärme und Licht" [On the relation between bodies' emission capacity and absorption capacity for heat and light]. Annalen der Physik und Chemie (in German). 109: 275–301. English translation: Kirchhoff, G. (1860). "On the relation between the radiating and absorbing powers of different bodies for light and heat". Philosophical Magazine. 4th series. 20: 1–21. Smith, Willoughby (1873). "The action of light on selenium". Journal of the Society of Telegraph Engineers. 2 (4): 31–33. doi:10.1049/jste-1.1873.0023. Smith, Willoughby (20 February 1873). "Effect of light on selenium during the passage of an electric current". Nature. 7 (173): 303. doi:10.1038/007303e0. Langley, S.P. (1880). "The bolometer". Proceedings of the American Metrological Society. 2: 184–190. Langley, S.P. (1881). "The bolometer and radiant energy". Proceedings of the American Academy of Arts and Sciences. 16: 342–358. doi:10.2307/25138616. JSTOR 25138616. ^ Stefan, J. (1879). "Über die Beziehung zwischen der Wärmestrahlung und der Temperatur" [On the relation between heat radiation and temperature]. Sitzungsberichte der Kaiserlichen Akademie der Wissenschaften [Wien]: Mathematisch-naturwissenschaftlichen Classe (Proceedings of the Imperial Academy of Philosophy [in Vienna]: Mathematical-scientific Class) (in German). 79: 391–428. Wien, Willy (1896). "Ueber die Energieverteilung im Emissionsspektrum eines schwarzen Körpers" [On the energy distribution in the emission spectrum of a black body]. Annalen der Physik und Chemie. 3rd series (in German). 58: 662–669. English translation: Wien, Willy (1897). "On the division of energy in the emission-spectrum of a black body". Philosophical Magazine. 5th series. 43 (262): 214–220. doi:10.1080/14786449708620983. ^ Julius, Willem Henri (1892). Bolometrisch onderzoek van absorptiespectra (in Dutch). J. Müller. Planck, M. (1900). "Ueber eine Verbesserung der Wien'schen Spectralgleichung" [On an improvement of Wien's spectral equation]. Verhandlungen der Deutschen Physikalischen Gesellschaft (in German). 2: 202–204. Planck, M. (1900). "Zur Theorie des Gesetzes der Energieverteilung im Normalspectrum" [On the theory of the law of energy distribution in the normal spectrum]. Verhandlungen der Deutschen Physikalischen Gesellschaft (in German). 2: 237–245. Planck, Max (1901). "Ueber das Gesetz der Energieverteilung im Normalspectrum" [On the law of energy distribution in the normal spectrum]. Annalen der Physik. 4th series (in German). 4: 553–563. Einstein, A. (1905). "Über einen die Erzeugung und Verwandlung des Lichtes betreffenden heuristischen Gesichtspunkt" [On heuristic viewpoint concerning the production and transformation of light]. Annalen der Physik. 4th series (in German). 17 (6): 132–148. Bibcode:1905AnP...322..132E. doi:10.1002/andp.19053220607. ^ Coblentz, William Weber (1905). Investigations of Infra-red Spectra: Part I, II. Carnegie institution of Washington. ^ Coblentz, William W. (William Weber) (1905). Investigations of Infra-red Spectra: Part III, IV. University of Michigan. Washington, D.C., Carnegie institution of Washington. ^ Coblentz, William W. (William Weber) (August 1905). Investigations of Infra-red Spectra: Part V, VI, VII. University of California Libraries. Washington, D.C. : Carnegie Institution of Washington. ^ "Implant gives rats sixth sense for infrared light". Wired UK. 14 February 2013. Retrieved 14 February 2013.